Very often friends and family who know I own and drive a project 1967 Camaro question me about how the project’s going asking: what have I done lately, what will I do next, when will it be painted, and what will it be like when it’s finished. I like talking cars so I always enjoy conversing what I’ve done and what I image it being but I also think I’d be fun to show what I’d like it to be rather than just relying on my verbal descriptions. If you’re interested I hope you enjoy the following. I will not be done for many years but it’s fun to bench build. You can go many different ways and use various styles when building up a classic car. I like most things classic so I want my Camaro to look and feel very much like the 1960s from which it came. It doesn’t have to be strictly original but I’d like to keep my modifications mild and hidden. I’ll use a bit more freedom with modifications that were common to the era and period correct for gearheads of the day. The main reason for this post is to show some colors. It’s easier to show colors than to describe them, and color makes up a large part of how people image a car. 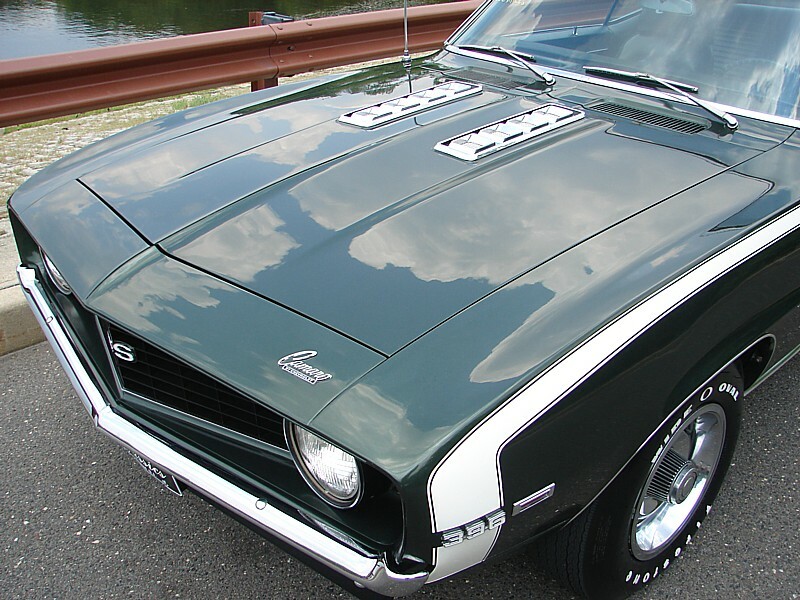 For a long time I was pretty set on fathom green as the color I’d paint the Camaro. It’s actually a 1969 color but I like it’s deep, dark look. Although it’s not strictly original for my ‘67 it would still look period correct. and ’68 Corvette bronze. Originally I did not consider any reds or blues because I see so many other red and blue Camaros on the roads and at the shows. Also, I’m more interested in using something other than the same few colors used on the cars made today. The auto industry used a much wider color palate in the 60’s, and I wanted to take advantage of that with my ‘60s muscle. That is largely the reason I like the bronze. Regardless of which of the above colors I ultimately choose I plan on using a white bumblebee stripe across the front. Not only do I love the contrast of a dark color with white but the bumblebee is fairly unique to Camaros and very 1960s. Nantucket blue with white bumblebee and correct 1967 grill and round parking lights. My Camaro currently has the grill and rectangular parking lights of the 1968 Camaro. I prefer these round lights. Also, I’d like to install a black vinyl top (except if I use the bronze). I like the two-tone styling it provides, and I like the contrast the textured vinyl has against the glossy finish of the paint. And, again, it’s fairly unique to ‘60s style. As I mentioned before, I like a good dark and light contrast. So I plan on matching the deluxe parchment interior to the dark exterior. 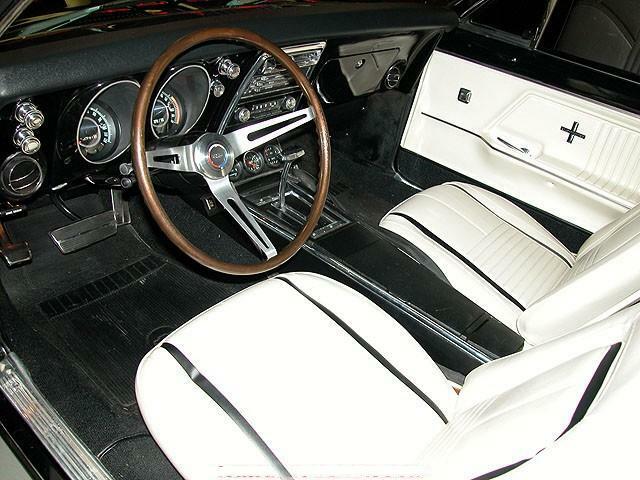 This white interior is another reason for the previously mentioned white bumblebee stripe. I think it’d be a nice way to draw the interior and exterior together as the white stripe highlights the white interior while looking in from outside the car. Up to this point most of the work my dad and I have done to the car has been on the engine, and I have the engine looking just about how I’d like to keep it. It’s a Corvette 327 and it has that original Chevy small-block appearance. 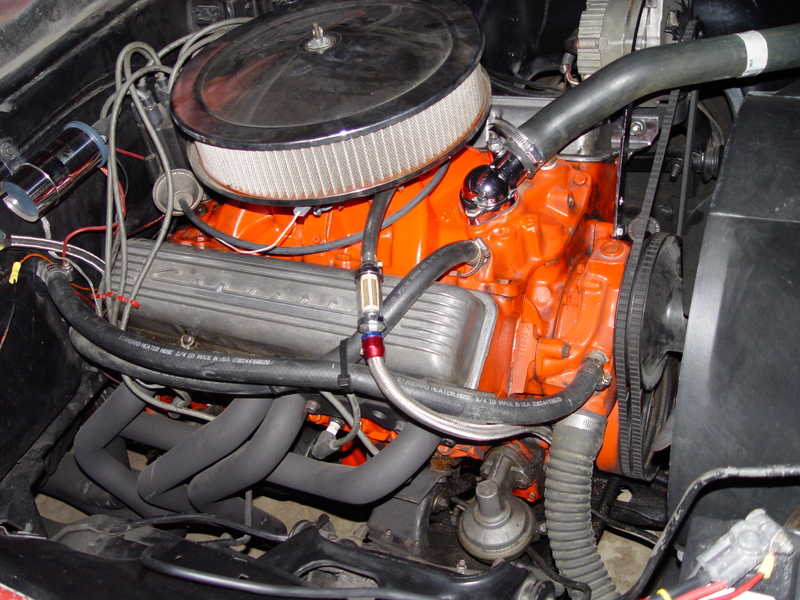 It has the beautiful, finned Corvette valve covers so it is clear it’s not the original engine, but a Corvette 327 swap would have been a modification done by original Camaro owners who wanted a little more horsepower. I still have some changes I’d like to make to the engine but they are changes that would affect the appearance very little (such as upgrading to aftermarket roller rocker arms). How a muscle car sounds is also incredibly important. It’s one of the main characteristics that make driving classic cars a much more visceral and full sensory experience. Much more than just a way to get from A to B. I’d like to have my Camaro sounding similar to the following two cars. Both are ‘60s small-blocks fitted with headers, chambered exhaust and the famous Duntov 30-30 cam used on the race-breed Corvettes and Z/28s. The cam provides the chop while the headers and chambered exhaust provide the throaty volume. 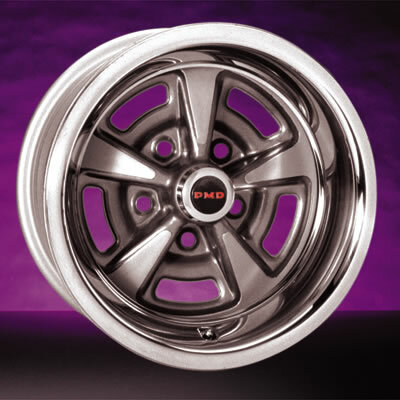 As for the wheels I’d like to use Pontiac Rallys like those I have on now (but in better condition). I have also considered American Racing Torq Thrusts which also provide a good ‘60s-modified look. I think I’ll keep using BFGoodrich Radial T/As because they’re a good and comfortable daily driver tire and I like the raised white lettering. I like redline tires but I don’t think I’d use them on a daily driver. What do you guys think? Any ideas? What color do you like best? American automotive enthusiasts and especially Chevy enthusiasts are living exciting and anxious times. For five years we have been without the Camaro, without Chevy Muscle. It has been trying times. But in recent years we have seen glimmers of hope: MUSCLE IS BACK! Almost since the Camaro’s discontinuation in 2002 there has been speculation, rumors and prayers for its return. When the Camaro was discontinued it was vastly out performing everything in its class and price range. It was a hard loss. Then Chevy lifted our spirits when they announced their intention to revive the Camaro and revealed its concept which blew everyone away. That all seems so long ago. We have been anxiously waiting for years. We have seen the car and our mouths are watering, our hearts are yearning and people have begun saving for the day it arrives at the dealers. There is even a countdown to the beginning of production of the Camaros. As the time draws nearer the more anxious I get. This whole thing reminds me of the stories I have heard about the secrecy and pride in the unveiling of the original classic cars such as when Chevy unveiled its new design and engine (the small-block that changed the world) in 1955. It set a date, closed the curtains of the showroom and kept the cars covered until that date. The car was highly anticipated and it proved well worth it. This new Camaro is now also highly anticipated and it appears it will be well worth the wait. In the midst of the anticipation every enthusiast is scrounging for any and all information, photographs and videos of the testing models of the car. Magazines and web sites have spies searching and chasing its development. Citizens are reporting sightings. And now magazines are calling for the citizens to keep their eyes pealed in search of an opportunity to photograph the Camaro (if you have the opportunity be sure to take those photos). Some of the latest photos came when someone one the street spotted a Camaro in camouflage being transported on the back of a diesel. It was on its way north to Alaska for cold weather testing (from what I heard). Recently official photos have been released (without the camouflage) to provide a better look. It is gorgeous in white. Check out this link. Part of the speculation surrounding the Camaro is: why is it taking so long to go into production. Part of the answer is that it is a completely new car (unlike the new Mustang or Challenger which are built upon previously existing designs). Also, its performance is being vigorously tested and tuned. Also, Chevy is working to keep the Camaro in the hands the everyday people and your average car guy. An example of this is that they are working to get a five star safety rating in order to keep insurance costs down. 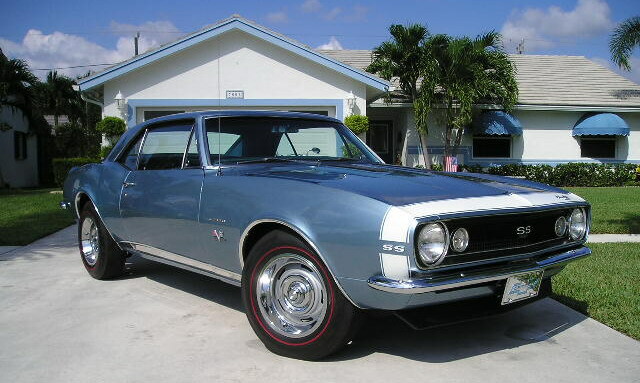 As the wait continues we must remember that when the first Camaro came out in 1967 it was three years after most of the other muscle cars hit the streets (the 4-4-2, the GTO and the Mustang), and still was able to astonish and compete.